All agave is NOT created equally!! Our premium blend of white & blue agave has both amazing health benefits and an incredibly yummy taste. So if you’re looking for a healthy and natural sugar replacement, look no further! Xagave is a delicious blend of agave nectars from the white and blue agave plants. This organic sweetener’s neutral taste makes it a versatile sugar substitute for all your cooking needs, while its low glycemic index and rich mineral content make it nutritious. 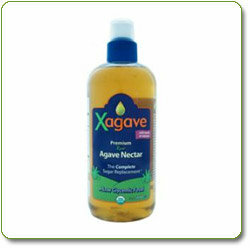 This Xagave Premium Raw Agave Nectar pack includes two plastic bottles of sweet agave nectar. 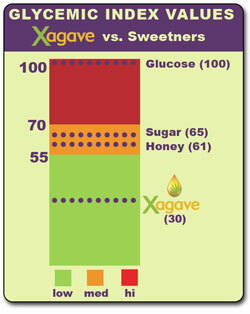 Unlike honey, high fructose corn syrup, and white sugar, Xagave doesn’t raise your blood-sugar levels. Xagave is a premium blend of natural nectars from the Agave tequiliana (blue agave) and Agave salmiana (white agave) plants. This unique fusion of nectars results in optimum taste and nutrition. Xagave is organic, raw, vegan, kosher, fair-trade and gluten-free. Delicious as a sweetener for coffee, tea, and hot cereal, it’s also simple to add to recipes in place of processed sugar. Soluble in hot or cold water, Xagave is easy to work with in the kitchen. You can use it for all your cooking, canning, and baking. It works well in jams, cakes, breads, salad dressings, desserts, cookies and sauces. Because Xagave is 1.4 to 1.5 times sweeter than sugar, the amount of calories saved by substituting it for sugar is significant. In addition, using it in your recipes reduces the amount of fats and oils required, resulting in a lower-calorie recipe. Printed on each bottle is a convenient sugar-exchange chart that makes it easy to substitute agave for sugar in any of your favorite recipes. Xagave has a low glycemic index (GI) of approximately 30. Unlike some sugars, such as high fructose corn syrup, honey, and white sugar, Xagave does not raise your blood-sugar levels. Though it’s recommended that you check with your doctor, a significant number of diabetic clients have noticed that agave nectar consumption does not impact their blood-sugar levels. In addition to its low (GI) and calorie-saving potential, Xagave’s special blend of nectars contains inulin fiber from the blue agave plant. Studies have shown inulin, a prebiotic fiber, promotes the healthy function of your lower intestine. It’s also been shown to moderate blood-sugar levels, increase calcium absorption, promote regularity, boost the immune system, reduce the risk of colon cancer, and increase bone density. Just three tablespoons of Xagave contain approximately seven to eight grams of inulin. Due to its raw processing at temperatures that do not exceed 117°F, Xagave retains its naturally occurring vitamins and minerals. Since it also contains agave nectar from the calcium-rich white agave plant, Xagave is a tasty way to provide your body with essential calcium–each tablespoon provides 17% of your daily calcium requirement. Two 18-ounce (25-ounce net weight) bottles of Xagave Premium Raw Agave Nectar. Xagave is the Complete Sugar Replacementand is truly where Delicious Meets Nutritious. Green Tea can prevent various diseases. Such as GABA (GABA = gamma amino butyric acid) has the ability to lower blood pressure. (Hypertension) has Phytosterol is highly effective in lowering cholesterol levels. (Blood fat) and also contains the former (DNJ: Deoxynojirimycin) compounds. Can lower blood sugar levels as well. Ideal for those with diabetes or high blood sugar (Diabetics). Also found in green tea leaves that have minerals and vitamins that are beneficial to the body, including the calcium content of milk over the eyes as well as potassium, sodium. Magnesium, iron, zinc, vitamin A, B1, B2 and C, and protein in the form of amino acids (Amino Acid) is the smallest protein molecules. Can be deployed quickly. Nutrients. Refreshing. Department of Agriculture in cooperation with the Faculty of Pharmacy. Rangsit University. Conducted research. This is a new discovery. Found in green tea leaves contain antioxidants, and 3 types of applications with Martin Ward (Quercetin) Fred Cambria The Coral (Kaempferol). And rutin (Rutin), which is a feature. – Preventing the intestinal absorption of glucose, the sugar and fat, and blood vessels healthy, good blood circulation. – Inhibits the formation of leukemia, breast cancer, colon cancer, leukemia patients allergic to life. All three of these substances can be absorbed into the body through the small intestine. The change also. The Green Tea also contains antioxidants that are important to the chemical phenol poly (Polyphenal) solutions, especially in oil volume. (Flavonoids) which has such features. – Reduction of stress due to the imbalance of the body. – Prevention of coronary heart disease cure. – Reduce the risk of coronary heart disease. Soy, Iron Fortified. Servings: Approximately One powdered serving size makes 8 fl oz (24 ml) prepared. Made without GMO Ingredients, Dairy-Free, Lactose-Free. Both Goat and Cow Milk contain dairy protein and lactose. A baby with dairy protein or lactose sensitivities may experience unusual fussiness, excessive spit-up, skin rash/eczema, gassiness or frequent ear infections. If your baby exhibits any of these symptoms, discuss using Baby’s Only Organic Soy Formula with a health care professional. Baby’s Only Organic Soy is made with organic ingredients. Organic is your assurance the ingredients are not genetically modified. Other non-organic soy formulas use a harsh chemical process to eliminate complex soy sugars that are known to cause discomfort to a baby’s developing digestive system. Nature’s One has innovated a process that naturally achieves the same result while maintaining the nutritional balance and harmony of the soybean as nature intended. The soybean alone does not provide complete nutrition. We carefully formulate additional organic essential fatty-acids and organic carbohydrate, vitamins and minerals that are needed for continued growth and development. The result is a complete, balanced, organic non-dairy formula for your baby. Organically grown/processed in accordance with the California Organic Foods Act of 199. Additional Nutrition Facts – One serving also provides: Choline 2mg and Inositol 8 mg.
Perennial, dioecious vine, grown as an annual in temperate climates. Growers have worked hard to bring this unique variety into production. Vines are vigorous, fruits are very large up to one pound, high yielding, and good in medicine or culinary usage. Bitter melon is native to the tropics worldwide. Use fruits before they turn very ripe and orange, slice thinly and stir-fry or add to soups. Bitter melon is probably the best antidiabetic herb known to herbalist, as it supports the pancreas and promotes secretion of insulin. Direct consumption, use in cooking, fresh tincturing and tincturing of the dried fruits are all viable methods of intake. The plants prefer full sun, a long growing season and a trellis. Insect-pollinated. A single vine can easily cover 10 square feet, so one packet should yield sufficient fruits for home use. Organic REAL cinnamon powder pack has finest quality real Ceylon cinnamon that you need to make a tasteful food. All product packs have a re-sealing zipper to protect them from moisture and enhanced shelf life. Our cinnamon has soft and sweet flavor compared to products found at regular grocery stores. Ceylon cinnamon has between 2-5 ppm of coumarin compared to Cassia (2000-5000 ppm). Our cinnamon is tested at US lab for Coumarin. HARNN’s Tichaa Organic Lemongrass and White Mulberry Tisane bulk pack contains a unique blend of White Mulberry leaves and Lemongrass for a refreshing, nutrient-rich tea. White Mulberry is naturally caffeine free and noted for its powerful anti-oxidant properties. Bragg apple cider, unfiltered, 1-gallon is made from whole organic apples, aged in wood, Bragg’s Apple Cider Vinegar is raw, unfiltered, undiluted and contains no preservatives! Hippocrates, the Father of Medicine, in 400 BC treated his patients with natural apple cider vinegar for it’s powerful cleansing, healing and germ fighting qualities. Improve your animals health from the inside out. EFA-3 contains the most important nutrient for your animal’s optimal health which is the vegetable source of omega-3, alpha linolenic acid. EFA-3 is a healthy blend of 90% organic flaxseed oil with an algal source of DHA(10%). It is a pleasant tasting natural unrefined oil that is added to your pet’s food on a daily basis.Folks, this is human grade oil. Be aware of products claiming to contain effective omega3.Effective omega 3 must be refrigerated from the time it is produced to be effective and get the results you are looking for. If it is in a powder form, a capsule, or a bag of feed it is either rancid or has been refined. Omega3 must be in a natural state(unrefined oil) to be effective. Fish oil has to be refined to overcome the toxins and foul taste. Sunflower,soybean and canola oils contain very little omega3. 100% guarantee. 32oz. Must be kept refrigerated. Evening Primrose Oil, also known as: Tree Primrose, King’s Cure All, and Sundrop contain an essential fatty acids including: oleic acid, palmitic acid, linoleic acid, stearic acid (a gamma-linoleic acid or GLA). And at 10%, it contains one of the highest known concentrations of GLA. The body doesn’t produce these fatty acids, so it’s important to get these nutrients through a diet and skin care. There is a wide range of evening primrose oil benefits that can treat many conditions. Some of these conditions include: Breast cysts, breast cancer, eczema, diabetes, diabetic neuropathy (nerve damage), multiple sclerosis, obesity/weight loss, rheumatoid arthritis, high blood pressure due to pregnancy, scaled dry skin, and skin irritation. For the past 20 years, Newman’s Own Organics has been offering Great Tasting Products That Happen to Be Organic. You can feel good about feeding our premium food to your beloved cat as it is made without artificial flavors, colors or preservatives. In fact, our Canned Beef Formula for Cats utilizes Organic Beef as the first ingredient. Our formulas are 95% organic and grain-free. Specially formulated for frequent use, this lightweight lotion will keep hard working hands soft and smooth. From harvest to home, Organic Kitchen and hand care products pamper the health conscious chef! Rich in organic aloe and made with only plant-derived ingredients and essential oils. Check with your doctor before you take any dietary supplement, including vitamins and minerals. If your doctor starts you on a supplement, watch for warning signals that could indicate problems: stomach discomfort, pain, headache, rashes, or even vague symptoms like tiredness, dizziness, or lethargy. Since early 1800’s Central Europe’s best medicinal spas have used Moor Mud therapy on scientific basis for pain management, to detoxify, improve circulation and immunity, reduce inflammation, to fight eczema and to rejuvenate. Alway keep hydrated. Drink water or decafeinated or light herbal tea. Neither iced nor too hot. Mix about 250 ml of Torf moor mud with warm pure water (you could use green tea or coconut milk) and few drops of essential oil if desired. The mix should be smooth and creamy paste for an easy application. Brush the paste on the body in an even layer starting from the feet up. Wrap the body in a plastic sheet, linen and a heated blanket (several blankets or steam tent will also work) and rest for 30 minutes. If you are doing a compression wrap, use presoaked ACE bandages instead. A period of rest of approximately 1/2 to 1 hour is recommended to support the metabolism-accelerating effect. Make sure the body stay comfortably warm. Drink plenty of water or decaffeinated tea immediately after the wrap and for the next 24 hours. For a full body detox 5-10 treatments are recommended, twice a week. Use caution when doing body wrap. Any body wrap treatment may be unsuitable or even dangerous for people with certain medical conditions: heart disease, high blood pressure, low blood pressure, diabetes, pregnancy, high temperature sensitivity. Consult your doctor before using the treatment. Always keep hydrated. Never drink alcohol before the wrap. Never do body wrap when on medication. Organic ceylon cinnamon is high in minerals and antioxidants which may help to promote stronger bones and joints in the body. The natural oil which cinnamon produces may also help sooth our body internally from inflammation. For arthritis suffers this helps ease the pain and discomfort of inflammation. -Take straight off the spoon daily to enjoy all the tastes and flavors. -tsp in a cup of warm water for an instant tea. -Mixed in yogurt as a snack. -Spread on toast for breakfast. Bee Strong is packed as a one month supply weighing 350gr/12.35oz. This mild lathering antibacterial hand wash is gentle on the skin and contains organic aloe, vitamins A, C and E to protect and nourish your hands along with essential oils of tea tree and grapefruit seed extract, both natural antibacterial agents to wash away germs. Winner of the 2008 Sofi™ silver for OUTSTANDING DESSERT TOPPING, Organic Nectars raw cacao Chocagave™ is a delicious organic, low-glycemic vegan gourmet chocolate agave syrup like no other, free of dairy, soy, refined sugar and gluten. Made from Organic Nectars raw cacao powder from cold-pressed, unroasted cacao beans, one of nature’s best sources of magnesium and antioxidants, and organic nectars raw organic agave syrup, the organic low- glycemic sweetener from the agave plant, suitable for diabetics, this may be the healthiest, most decadent chocolate sauce ever! Hand made at below 118º F to maximize nutritional value, raw cacao Chocagave™ is a heart-healthy treat that can be drizzled on fruit, ice cream, cakes, on waffles, pancakes and crepes, in milk, tea, coffee and smoothies, and whatever else you can imagine! Certified organic & kosher. Perfect sweetner option for Vegans & Vegetarians. Agave Nectar is the perfect sweetener choice for vegans, vegetarians and raw / living food diets. It can be used in place of honey, corn syrup & maple syrup. It can be substituted for sugar in most recipes. Agave is sweeter than sugar, so generally 2/3 cups of agave replace 1 cup of sugar. Experiment to taste. It is certified organic, 100% pure and contains no animal products of any kind. Made from the Agave Salmiana (not the Blue Agave) that grows in the high desert regions of central Mexico. Agave nectar has a low glycemic index of 32. Compare to 58 for honey and 64 for table sugar. Agave has the same calories as honey, but as most folks find it to be sweeter less is needed. In such a case, less calories are consumed. Organic Fenugreek seeds powder pack has finest quality powder that you need to make a tasteful food. These high quality hand picked seeds will give you the taste and aroma that a food lover needs. All product packs have a re-sealing zipper to protect them from moisture and enhanced shelf life.